In the bowl of an electric mixer, combine the flour, sugar, and salt. (If you don’t have an electric mixer, you can do this by hand with a pastry cutter — but the KitchenAid makes it so much easier!) Add cubed butter and toss with the flour to coat. With the paddle attachment, mix on low speed until the mixture starts to resemble cornmeal — the butter should be broken up, but not completely incorporated. Then add the cold water and mix on low just ’til the mixture starts to come together. Turn out onto a floured surface and form the dough into a ball (or two of equal size, if you’re making two crusts) with your hands. You want to keep the dough cool, so touch it as little as possible while you’re working with it. Now this next bit will probably get some people worked up: do not chill your dough before you roll it out! Roll out into a twelve inch circle (if you are making two crusts, you can put the second dough ball in the fridge while you work on the first to keep it cool), flouring all along and rotating the dough often to prevent it from sticking to your surface. To make shaping the crust easier, I usually trim the edges to a perfect circle using a 12″ cake board as a guide, but that’s optional. Fold the crust in quarters and transfer it to a 9″ pie pan, then unfold it and center it, easing it down into the corners and trying not to stretch the dough. If you’re making a single crust pie, go ahead and shape the crust now: tuck/roll the edges under on themselves and shape them decoratively or crimp lightly with a fork. If you’re making a double crust pie, just put the pie pan in the fridge without shaping the edges. Roll out the second dough ball to another 12″ circle, and chill it on a flat surface (I use the 12″ cake board for this, but you could use a cookie sheet or any other flat surface). 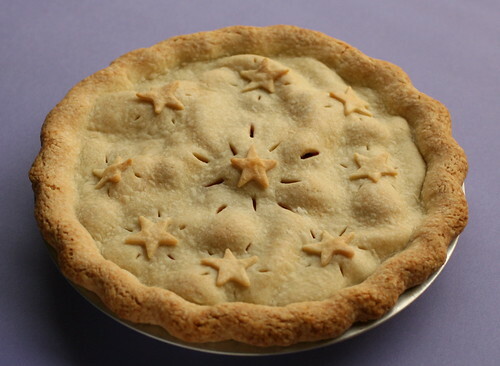 Optionally, you can re-roll any scraps you’ve got leftover and cut out stars, hearts, leaves or whatever decorations you’d like to put on your pie. Defrost the peaches by dumping them in a bowl and running cold water over them for around ten minutes. It doesn’t have to be much running water, just a slow stream to get the convection current going. If you’d rather defrost them overnight in the fridge, that’s fine too, but I’m hardly ever smart enough to plan that far ahead! Drain the peaches, put them in a bowl, and add a few tablespoons of flour and a few tablespoons of sugar. (I’m sorry I can’t be more specific, but I’d just be guessing as I never measure these. Okay, I’ll guess — 3 tbsp. of each? That’s a fair starting point. If you like a sweeter pie, you can certainly add more sugar.) Toss the peaches to evenly distribute the flour and sugar, then let them sit a few minutes in the bowl. Get your both crusts out of the fridge and start filling the bottom crust with peaches. Add about half the peaches to the pie at first, and spread them out as evenly as you can, leaving as little air space between the pieces as possible. 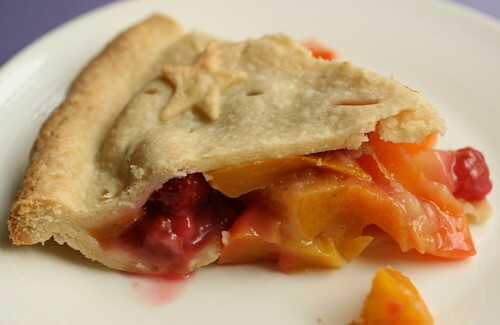 Now sprinkle about half of the raspberries into the pie, and cover them with the remaining peaches, again trying to spread them out evenly and leave as little air space as possible. Mound the filling higher in the center than at the sides of the pie. Finish by dotting the filling with the remaining raspberries, and adding small chunks of unsalted butter here and there. Either slide or flip your top crust from its current resting place to the center of your filled pie. If it’s still stiff from the fridge, don’t be afraid to run your hands over the top lightly to help warm it up. Pat the crust down snugly on top of the fruit, and when you get to the edges, use your finger to dab a little water along the rim of the bottom crust to help it stick to the top crust. Pat the two crusts together, then tuck the extra edge of the top crust under the edge of the bottom crust to make a tighter seal. Once you’ve done this around the entire perimeter of the pie, you can either pinch the crust roll into a wavy design (as in the photo above) or use a fork to crimp the edge lightly. Slice some vent holes in the top crust with a sharp paring knife, add decorations if you’ve got ‘em by wetting the back of each piece to stick it down, and put the whole thing back in the fridge for about 30 minutes. Meanwhile, preheat your oven to 350°, and after the pie is done resting in the fridge, put it on a cookie sheet to catch any drips and bake for about an hour. You’ll know it’s done when the top is lightly golden and you can see the filling bubbling through the steam vents you cut in the top crust. Now take the pie out and let it sit on a cooling rack for as long as you can possibly manage to wait. In theory, the pie should be cooled completely before you cut it open, but I won’t tell if you only wait an hour and a half. The sooner you cut it, the soupier the filling will be, but it will still taste great. Eat it for dessert, eat it for breakfast, eat it for an afternoon snack. Before you know it, it’ll all be gone and you’ll have to bake another!